Your sauce should be prepared and set aside for assembly. Cover and let cook at medium-medium-low (3 to 4 on the dial) turning once when your spinach is almost cooked. Spinach will compress a lot when cooked. Put eggs on top of spinach trying to keep them at the center of the bowl (a little salt and some ground pepper may be added to the egg surface). In the meantime, poach or shirr eggs. Place cooked eggs on top of spinach keeping them at the center of the bowl (a little salt and some ground pepper may be added to the egg surface). Serve dishes OR fire briefly under the broiler just to brown the sauce ... and serve. The dish, just out of the oven is hot and so is the food inside. The spinach can cause burns in your mouth and, while absolutely delicious, eggs florentine should be eaten carefully. It's all about taste: Add or deduct time depending upon the starting temperature of your eggs and to taste. Add a few minutes if you prefer your eggs hard. Cook it less if you like them very soft. This Eggs Florentine recipe uses our cheese sauce poured over eggs on a bed of cooked spinach - and baked in French Onion Soup bowls, Souflee bowls, or a similar oven safe, single serving dishes. The easy way to execute this dish: make a bed of cookied spinach in the bottom of your bowl. 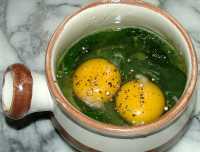 Drop a poached or shirred egg or two on the spinach and top it all off with a hollondaise. 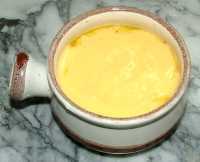 Variations use a bechemel or cheese sauce. 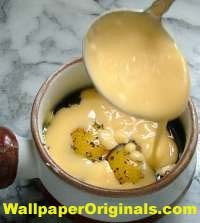 We like cheese sauce. Eggs Florentine is a breakfast treat around here. It's a Sunday morning breakfast ... when we have time to prepare and savour this delightful, layered dish - and time to sit a while afterwards. Eggs Florentine is served, around here with a fresh loaf of French Bread and, if we're lucky and still have, some of our own, home made jams.